Hussey Seating's MAXAM 1 is designed to be the safest and most comfortable portable bleacher available. MAXAM 1 quickly brings the security, luxury and durability of a large gym bleacher system to nearly anywhere on campus. Designed for quick and easy one-person transport and operation, MAXAM 1 takes seating from courtside to rink-side, indoor pool to cafeteria, auditorium to meeting room with ease, safety and comfort, all backed by a best-in-class five-year manufacturer's warranty. Child Safe Outdoor Fan Bleachers meet or exceed even the most stringent local and state codes for child safety with the addition of a second floor plank and a heel kick plank. Closing the gaps common in traditional bleacher designs reduces the possibility of a child falling or climbing through openings. Constructed of galvanized steel structure, aluminum planks and recycled plastic ground runners, bleachers are available in three-tier (30 capacity) and four-tier (40 capacity) models. Athletes work hard, rain or shine, so help them rest up between plays in a Players' Sideline Shelter. This semi-permanent, 8-foot-high, 16-foot-wide, 7-foot-deep unit provides an unobstructed view with its tinted plexiglass back and sides, and protection from the elements with its powder-coated aluminum canopy. Generously sized seat and backrest offers comfort, while a convenient elevated shelf with a hinged cover opens to store athletes' gear. Optional padded trainer's table can be connected in rear. When you need to get bleacher seating in the right place at the right time, consider the Speedy Bleacher system. The Speedy Bleacher system by Kay Park Recreation is highway-towable, push-button-operated and folds with hydraulics. The unit's simplistic design allows you to move it around town for parades, viewing stands and sporting events where seating other than normal, fixed seating is needed. GT Grandstands designs and manufactures premium-quality grandstands, bleachers and a range of spectator seating options. These options include permanent grandstands, press boxes, existing structure renovations, standard portable bleachers and team benches. GT Grandstands offers a variety of bleacher styles that range from two to 15 rows and can include ADA accessibility features. 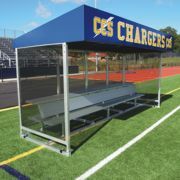 All bleachers are code-compliant and feature a five-year warranty. Bleachers also can be customized to meet site-specific needs. The 15-row series of TranSport mobile grandstand bleachers offer an expanded dimension for temporary event seating. Featuring the same fast and easy one-person, powered setup of Century's popular 10-row highway mobile bleachers, one can now have 50 percent more seating capacity per frontage foot, per delivery and per setup, plus 50 percent greater visibility for spectators. Century's 15-row mobile bleachers offer increased flexibility and utility for stadiums and athletic fields, allowing quick, easy reconfiguration of spectator seating to suit the event. Create instant sideline seating for recreation sports with the expandable Bag-A-Bench. Unfolds to seat six players or fans comfortably. Because of its functionality, portability and durability, Bag-A-Bench is becoming standard equipment for youth teams. Tough, Cordura canvas backs remove easily for printing team logos. All-steel frame is durable and provides back support. Available in Red, Royal, Navy and Black. Comes with handy carry bag.